This is a dream come true and an opportunity that you can't miss. If you don't have easy access to an oscilloscope then you must get a copy of this book. Use it to guide you through the construction of your very own PC based oscilloscope complete with calibrator and signal generator. All it takes is a few cheap components and a small amount of your time. A small price to pay for such awesome test gear. 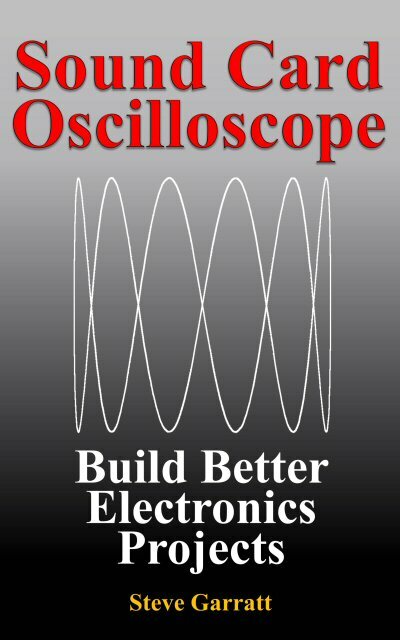 The book reveals in detail how I built my oscilloscope circuits into nice enclosures so that you can reproduce it and use it on all of your projects. I've documented each step in the process, even down to how to drill holes in the enclosure to mount the parts. What people are saying about "Sound Card Oscilloscope"
A well written example of a nice project for a beginner. This book is well thought out with lots of pictures, even I could follow them. This book is ideal for a beginner who has little to no knowledge of electronics and within the space of a few days you could have a project to be proud off. The hand drawn diagrams give you a nice sense that the person actually built this project and not just copied other peoples work which is the case with a lot of books. The idea to combine the computers sound card to make a piece of test equipment is brilliant. I get the best of both worlds, computers and electronics. Congratulations for your very valuable contribution to the knowlege of younger people now starting in electronics but also for the more experienced by providing them with the calibrator and signal generator. Wonderful idea. I am an electronics hobbiest with 30 years plus of DIY experience and primarily self taught through reading. I haven't seen a book of this aptitude in a long time. Steve Garratt is personable in his writting and challenges you to enjoy learning while reading this well written, fun and very easy to follow book. I recommend this book to anyone interested in the field of electronics no matter how new or advanced! I really liked how this book provided clear instructions on how to build a oscilloscope from home. Oscilloscopes are extremely useful, but usually very expensive. In this book, the author showed how to do everything from soldering the components to making a nice box for the project. It gives you exactly what the title promises. A sound card oscilloscope. I would definitely recommend this book for anyone interested in DIY electronics. I was able to follow the author's instructions easily. Even though I have limited knowledge about DIY electronics, I was able to follow the author's instructions easily. In addition, the author has made the task of building a sound card oscilloscope within reach for many more enthusiasts. A great book! Maybe it works first time which would be great but it might not be working quite how you expect. More often than not your circuit will not work correctly first time, mine rarely do, so what do you do then? You can build yourself a Sound Card Oscilloscope to use with your PC and it will cost a fraction of a commercially made scope. The electronics projects detailed in this book are likely to be amongst the simplest that you will ever come across which is surprising considering how much they can do for you. This isn't one of those quick and easy circuits that you build once. They are certainly simple circuits but you will want to use them over and over again. That's exactly what I thought until I came across an excellent piece of PC software, free for private use, that turns your computer's sound card into a full blown and very capable PC based oscilloscope. It was at that moment I realised that you can make a cheap oscilloscope that is surprisingly useful and it can be built by just about anyone. It's surprising what you can do even when limited to measuring audio frequencies. This book is about how I built a dual trace sound card oscilloscope, calibrator and signal generator project from start to finish. I've recorded my steps in detail so that you can build it too. I describe all the circuits as well as how I built it into a small enclosure. I tell you where you can buy the components and where to download the computer oscilloscope software. I describe the software, how to use it and what you can use it for. It's a tutorial that compliments the official user's manual. If you are wondering what oscilloscopes do, what they are used for and how they can help you with your electronics projects then I've done my best to answer that question. I present two examples of Windows™ PC based oscilloscope software in the book. The first one is very easy to use and free for private use so it's the one I suggest that you start with. The other is a little more difficult to get used to but it also does a lot more for you even though it is completely free. They are both impressive and very capable applications. The computer based sound card oscilloscope is a powerful piece of equipment and will make a great addition to your tool kit by itself but there is more. Not only can it measure and display waveforms the software is also capable of generating audio signals at the headphone socket. It has its own signal generator and so building an output driver to take advantage of this feature makes sense. The second project in the book details the design and construction of a unit to calibrate the oscilloscope functions and to interface with the waveform generator output. The calibrator/signal generator is a slightly more complicated project but it is still quite simple. The oscilloscope calibrator will allow you to measure AC voltages more accurately on your new PC oscilloscope and the signal generator can provide useful signals to help you build future projects. Not only do these projects provide you with amazing electronics design and test tools they are also great educational aids. Learn about how to use an oscilloscope, waveforms, frequency analyzers, phase shift, Lissajous figures and more. Make a sound card oscilloscope and use it to build better electronics circuits. An oscilloscope is useful for examining alternating waveforms and diagnosing problems in electronic circuits. It doesn't directly test individual components but may give you clues to where faults lie.